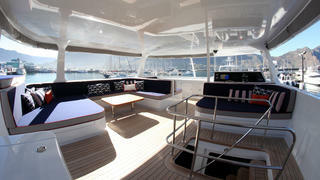 Ultra Vires, the largest yacht in the Two Oceans Marine range to date, has been launched by the South African yard. This 25 metre catamaran is the first hull in the Open Ocean 800 range and was developed in collaboration with Du Toit Yacht Design, following in a strong tradition of multihull superyachts. Ultra Vires was designed with watersports firmly in mind, with space on board for storing superyacht toys such as surf boards, stand-up paddleboards and kite surfing equipment. Her open and free-flowing interiors feature a monochrome decor and extensive wood panelling, as designed by Hanno de Swardt. 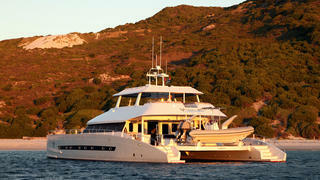 Accommodation is for eight guests across four en-suite cabins, while the crew quarters allow for a staff of two. 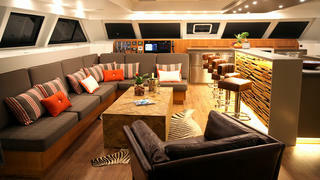 Relaxation spaces include a spacious main-deck saloon, which makes the most of Ultra Vires’ generous 11-metre beam, and two shaded cockpits, one on the main deck with its own bar, and another on the upper deck. An aft-deck davit crane can be used to store Ultra Vires’ 6.4 metre tender, while a smaller tender and a Jetski can be stored on the foredeck as well. Ultra Vires is powered by a pair of 305hp Cummins QSB5.9 305MCD engines, which give this catamaran superyacht a transatlantic cruising range of around 4,500 nautical miles, even when towing a 15 metre support vessel. 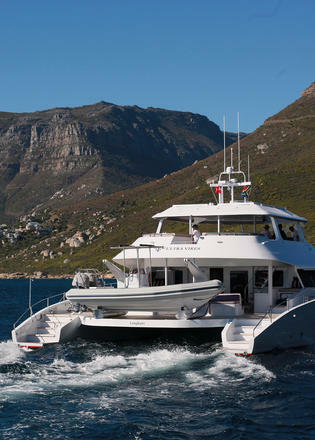 Based in Cape Town, Two Oceans Marine is currently working on a second hull in the Open Ocean 800 series, which will have a smaller saloon to free up more cockpit space.